Over the past five years there have been many questionable ‘meetings’ in the Adelaide-Metcalfe council chambers, especially when wind turbines are involved. For starters, the mayor and the deputy-mayor have close relatives who have signed wind option agreements, and they never declare a conflict of interest. Then there was the time the police were called to stop a resident from video recording the open meetings. Oh yes and when the CAO’s husband physically struck out at a resident taking a picture of them entering a closed meeting with Suncor. Items have been left off agendas, mis-reported in minutes…the list goes on, and frustration builds. So to say the residents are skeptical, leery, untrusting of this council, is an understatement. And for good reason. Even the ombudsman’s office has had their fill of this council. With 6 “Best Practices”, and 3 “Violations” found in the last year and a half, this little township of 3000 is practically topping the province for infractions— beating out the big cities (oh yes, even London). If a resident happens upon an improper closed meeting, it’s usually by fluke. And so it was with the most recent revelation with the Ad-Met council, when a closed meeting on January 25, 2012 was discovered in the “Municipal Correspondence” section of the wind developer WPD’s submission (See pg. 130). Yep, check those out for your local project! Crowds no longer come to the general store Joe Wood’s grandfather built 107 years ago. 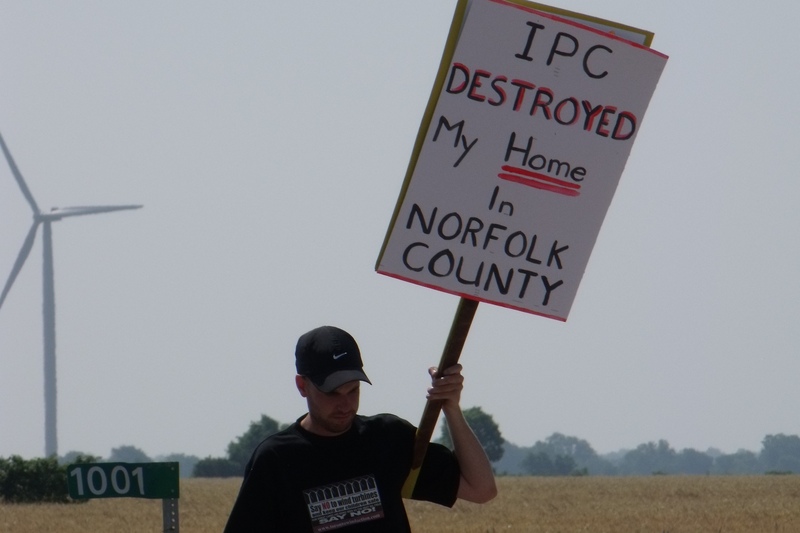 Most of its products are gone too, the rural locale west of Strathroy too far from suppliers. Now, Wood is surrounded mainly by guns and ammo at the store. 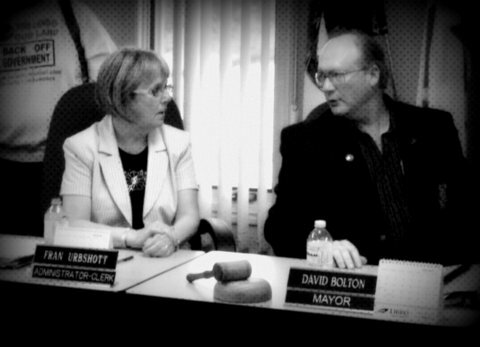 Mayor David Bolton still stops by mornings to share gossip and drink a diet Pepsi. So Wood knows something about the kerfuffle at the township office of Adelaide-Metcalfe, a provincial creation that joined two tiny hamlets and farmland into a new municipality with only 3,000 people. This week, more than 100 residents came to council — that’s 1 out of every 30 residents, akin to 12,000 Londoners showing up at city hall. Some carried signs and shouted for Bolton to resign. Others carried generations of ties to the area and spoke of their concerns diplomatically. Bolton twice phoned police to stop citizens from videotaping meetings. Police threatened an arrest the first time, but stayed out the second. Deputy Mayor Adrian DeBruyn voted to set fees for wind turbine permits, even though his son has signed 32 leases with a wind company. The township hired the mayor’s kids to shut off lights of a park and take away a few garbage bags. Please share and encourage your friends and neighbours to attend! 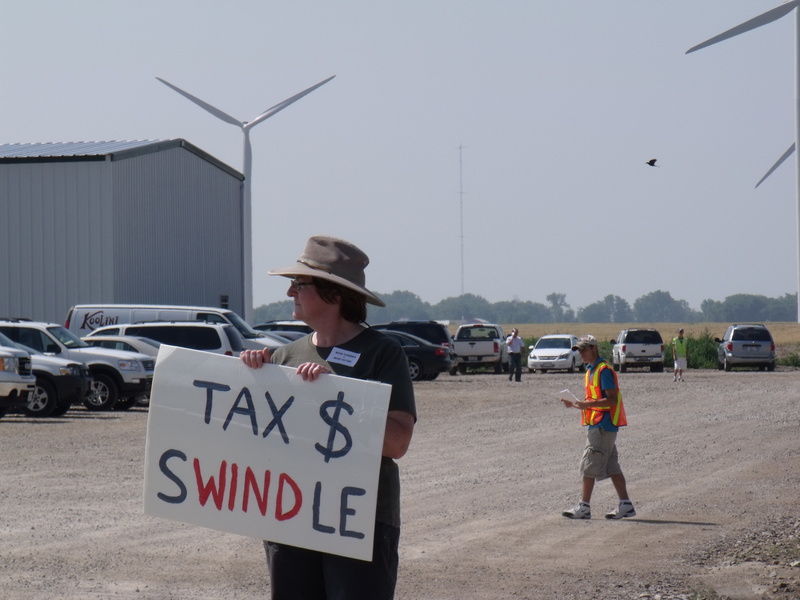 Monica Elmes – Monica lives and farms near Ridgetown, ON surrounded by a 43 turbine (2.3 MW each) industrial wind project. She will relate how the wind development has changed her community and the health of her family and neighbours. 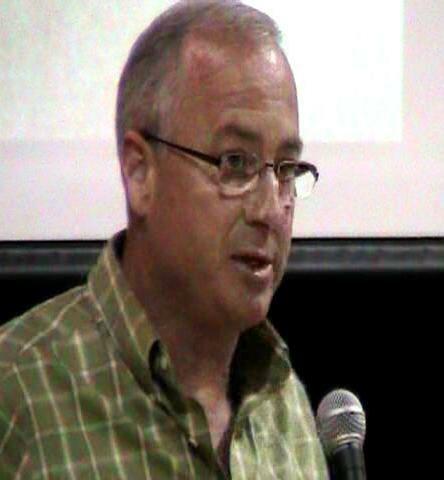 David Colling – A dairy farmer for 30 years in Ripley, ON, who has also been a dealer for Bio-Ag Consultants and Distributors since 1991. David studied Electrical Engineering at Ryerson Polytechnical Institute, and currently uses his vast knowledge, throughout Ontario, to assess electrical pollution in homes, farms and businesses that are presently in the vicinity of industrial wind turbines. Note: The Mayor’s dad has a wind lease with TCI Renewables and the Deputy Mayor’s son has 32 leases with NextEra. No, I didn’t type the wrong number…. At an Adelaide-Metcalfe council meeting, the mayor calls in the OPP, exercising his “power of Authority” to remove the videographer from a public/open meeting. 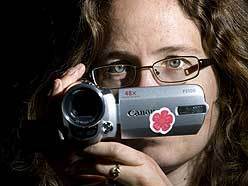 the township did not have a bylaw that prohibited videotaping. At a previous meeting the council had discussed videotaping the meeting themselves, or asking videographers to write a letter of intent to council before a meeting that they want to tape. But no discussion was made this day. The mayor ambushed with calling the cops – no alternatives. Some democracy that is… People- don’t let your democratically elected council run your township like a dictatorship! “Adelaide II was a longer term project based on the view that the transmission lines in the ‘West of London’ transmission area would likely be upgraded to facilitate the connection of additional renewable capacity. Given that there were a few projects called Adelaide already, we decided it was best to change the name to White Pines in an attempt to avoid confusion. This project is in the early stages of development and therefore the project infrastructure has not yet been identified or designed. We will issue a project notice and notify the public as per REA guidelines, in the event that this project moves forward in the development process. Wind-turbine opponents are demanding Adelaide Metcalfe council repeal a new turbine-building fee it imposed unexpectedly and without notifying them. The rural township west of Strathroy, where two companies are proposing to build 68 wind turbines, approved a $10,000-per-turbine fee at a Jan. 16 meeting. Last month, scores of people attended a council meeting to ask the fee charged be even higher than that. The issue was set aside so staff could learn what other municipalities charge. She said she didn’t see the item on the agenda, otherwise she’d have attended the meeting. A plan to escalate fees for companies wanting to erect wind turbines in Adelaide Metcalfe has been deferred until politicians can determine if charging $10,000 per turbine would cover the potential costs. The current fee is $500, which local politicians have said is far too low to justify the engineering costs and other expenses which the Strathroy-area municipality could incur as the massive wind machines are put into service. A council meeting this week to determine how much more to charge — the proposal was $10,000 per turbine — drew scores of residents. Many called for even higher fees, along the lines of the $40,000 some Ontario communities are charging. One resident said $10,000 would be too low even to inspect one of the structures. Council heard submissions for about two hours before sending the matter back to staff to look at whether Adelaide Metcalfe should be a leader or a follower in the fee battle. “What really pleased me was the response from the community,” said Esther Wrightman, who recalled that she and her family felt alone in their opposition when they first started talking with council a year ago. Two wind energy giants, NextEra and Suncor, are looking to build as many as 68 turbines in the rural community. Although the province has been promoting its green energy strategy — and this week promoted a report that says wind turbines don’t have any direct health effects — opponents say turbines can produce low frequency noise, harm bird migration and reduce property values. Green energy giants NextEra and Suncor plan to build as many as 68 wind turbines in the Adelaide Metcalfe area in two separate projects. No date was set for Adelaide Metcalfe council to debate the issue again. E-mail deb.vanbrenk@sunmedia.ca , or follow DebatLFPress on Twitter. Wind energy companies may have to pay sky-higher fees if they want to set up shop in Adelaide Metcalfe. And the Strathroy-area municipality’s plan is only one of several ways turbine opponents and politicians are showing frustration with what they see as a lack of local decision-making power about green energy. Charging a building-permit fee of $10,000 per turbine — the current fee is $500 — isn’t a cash grab and is intended to be a break-even plan, Adelaide Metcalfe Mayor David Bolton said Monday. An engineering review of a single turbine can cost $4,500, Bolton said, and that doesn’t include re-reviews or inspection costs. Adelaide Metcalfe has planned a public meeting on Dec. 19 about the proposed fee hike. Bolton hopes the higher levy will be in place by January — well before any turbines are in the ground. Like anybody needs to or wants to know about this, but good ‘ol sell-out TCI Renewables is scratching together another project for Adelaide-Metcalfe 80-100MW (~50-70 wind turbines).